After debuting early this year with a full-length record called Be Quiet As You Leave, Chicago's Static in Verona (a.k.a. singer-songwriter Rob Merz) is back with a free four-song EP, Life-Sized Replica. Listeners might already be familiar with Merz's work via his band Ash Avenue, but in Static in Verona he assumes all roles, from songwriter to multi-instrumentalist to producer. The project might be a one man show, but that doesn't detract at all from the quality of music on Life-Sized Replica. The songs here - which could best be described as accessible indie pop with subtle electronic flourishes - feature solid production, strong performances from Merz and appealing melodies. EP opener "Forgetful" is a highlight, as is "Circle Takes the Square" (which takes on Matthew Sweet-esque power pop very effectively), but all four songs are worthy of repeat listens. 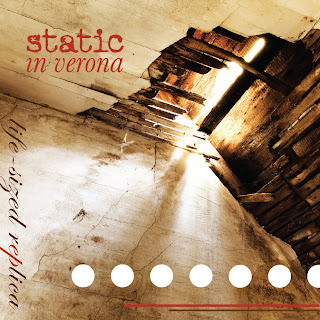 Download mp3: Static in Verona - "Forgetful"
Merz is offering Life-Sized Replica for free download on staticinverona.com. If you like what you hear, you can get Be Quiet As You Leave at CD Baby, iTunes, Amazon mp3 and eMusic.